Jet set with shu! Transform well-traveled tresses with shu favorites, perfect for on-the-go. Plus, receive an exclusive online-only offer when you purchase your kit. urban moisture travel size shampoo [75 ml]: gently cleanses and detoxifies hair from urban impurities, preventing dullness while gently moisturizing every strand. urban moisture travel size conditioner [75 ml]: delivers essential nourishment and hydration, leaving the hair feeling smoother and softer to the touch. essence absolue travel size nourishing protective oil [30 ml]: #1 best-selling multi-use hair oil that moisturizes and protects hair with intense nutrition. limited-edition travel pouch [30 ml]: pack up your favorite travel-sizes in a perfectly portable zippered clear pouch. Moringa flower with its purifying power and Red Algae extracts full of anti-oxidants gently remove urban impurities, preventing dullness and leaving the hair purified and nourished. The Camellia Oil in Essence Absolue is one of the most rapidly absorbed oils. It provides deep nutrition and moisture as well as helps to maintain the lipid balance of the hair fiber, imparting a supple and velvety feel. 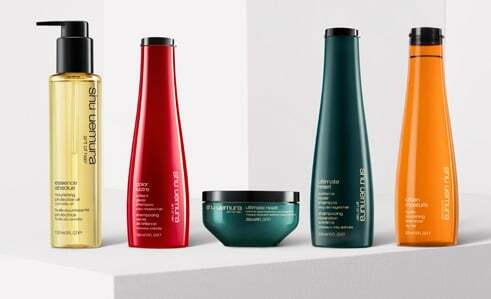 Shampoo: Aqua / Water● Sodium Laureth Sulfate ● Coco-Betaine ● Laureth-5 Carboxylic Acid ● Cocamide Mipa ● Glycerin ● Amodimethicone ● Sodium Chloride ● Polyquaternium-10 ● Ppg-5-Ceteth-20 ● Sodium Benzoate ● Peg-55 Propylene Glycol Oleate ● Propylene Glycol ● Salicylic Acid ● Peg-60 Hydrogenated Castor Oil ● Tocopherol ● Glycine Soja Oil / Soybean Oil ● Alcohol ● Hexyl Cinnamal ● Hydroxycitronellal ● Caramel ● Sodium Acetate ● Safflower Glucoside ● Phenoxyethanol ● Isopropyl Alcohol ● Gentiana Lutea Root Extract ● Moringa Pterygosperma Seed Extract ● Corallina Officinalis Extract ● Disodium Phosphate ● Citric Acid ● Bht ● Sodium Citrate ● Sodium Hydroxide ● Parfum / Fragrance. Conditioner: Aqua / Water ● Cetearyl Alcohol ● Behentrimonium Chloride ● Glycerin ● Peg-180 ● Potato Starch Modified ● Amodimethicone ● Cetyl Esters ● Isopropyl Alcohol ● Phenoxyethanol ● Hydroxyethylcellulose ● Trideceth-6 ● Tocopherol ● Glycine Soja Oil / Soybean Oil ● Sodium Pca ● Chlorhexidine Digluconate ● Alcohol ● Cetrimonium Chloride ● Safflower Glucoside ● Hexyl Cinnamal ● Hydroxycitronellal ● Gentiana Lutea Root Extract ● Moringa Pterygosperma Seed Extract ● Corallina Officinalis Extract ● Disodium Phosphate ● Citric Acid ● Bht ● Sodium Citrate ● Parfum / Fragrance"
Oil:"Cyclopentasiloxane ● Dimethiconol ● Camellia Kissi / Camellia Kissi Seed Oil ● Ethylhexyl Methoxycinnamate ● Butylphenyl Methylpropional ● Hexyl Cinnamal ● Hydroxycitronellal ● Parfum / Fragrance.